Bona cleaners are trusted for breathtaking results, no matter the floor type. Stone flooring combines nature and elegance with easy maintenance and indestructibility. The wide array of textures and colors provide a distinctive look perfect for heavy-traffic areas such as kitchens, bathrooms, foyers and laundry rooms. 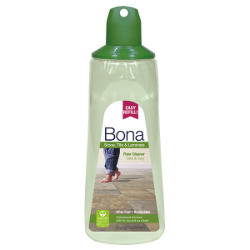 Bona Stone Tile & Laminate Floor Cleaner is pH neutral formula that won’t damage your stone floors. The fast-drying formula gently cleans your stone floors without leaving any residue behind. Luxury vinyl flooring offers a wide variety of style options while maintaining durability and ease of maintenance. Available in tiles or planks, luxury vinyl flooring makes realistic 3D replicas of natural surfaces. Great for busy areas with years of carefree beauty, luxury vinyl is a great choice for any budget. 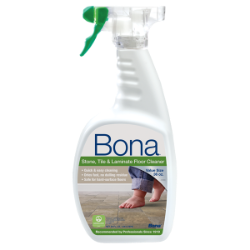 Bona Stone Tile & Laminate Floor cleaner has a streak-free formula that quickly and easily removes dust, dirt and grime from your floors. High-performance laminate can simulate wood or tile floors and is extremely durable and easy to clean with either a damp cloth or vacuum. Laminate flooring is scratch and dent resistant, making it a solid choice for family-prone areas. Bona Stone Tile & Laminate Floor Cleaner has a streak-free formula that cleans dirt and smudges from your laminate floors. The fast-drying formula leaves no residue behind for simply beautiful floors. Tile flooring is a great option for creating unique, long lasting flooring designs. Not only can designers mix and match colors and patterns to match any taste, but tile can also be manufactured to mimic other natural flooring like hardwood and natural stone. 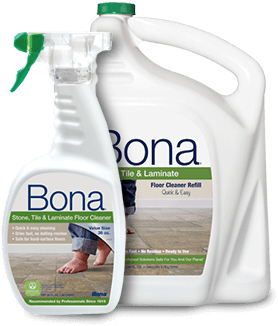 Bona Stone Tile & Laminate Floor Cleaner is ready-to-use and doesn't require any rinsing. The fast drying formula removes dirt and grime for a quick and easy clean. I tested it out on a piece of scrap laminate the installer left me before using it on my floor. So far I’m very impressed. It’s quick odorless and leaves a smudge free shine. I use both the hardwood and tile cleaner. They both do a great job and I love the fact that both cleaners are pet friendly since we have 6 cats. I love the way this product leaves a clean glow on my laminate floors and is so simple to mop on! I bought this a few months ago,it works great. I wouldn’t use anything else. My floor always looks great! 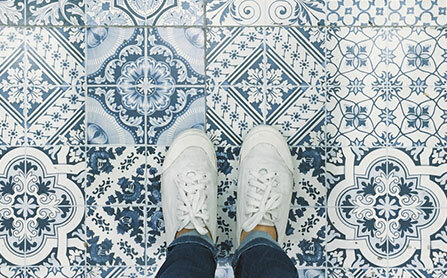 Explore tile trends to find the perfect color and style for your dream floor. 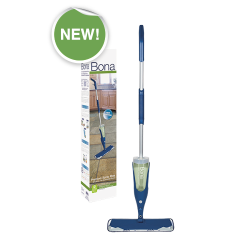 The next generation Bona Stone, Tile & Laminate Floor Mop is a premium spray mop that combines the quick & easy Bona Stone, Tile & Laminate Floor Cleaner in a convenient cartridge along with the Bona Microfiber Cleaning Pad. 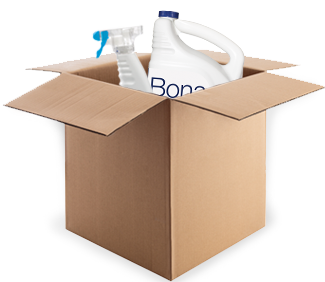 The Bona® Stone Tile & Laminate Floor Cleaner Cartridge is a replacement cartridge for your next generation Bona Spray Mop. A flat bottom and a wide opening provide an easy refill experience. The innovative bag-in-bottle design allows for an even spray every time. The rinse-free, streak-free formula cleans hard-surface floors effectively by removing dust, dirt and grime leaving your floors clean and beautiful.